The Strom Thurmond Career Center FFA Agronomy Team and Tool Identification Teams finished strong in their respective State Career Development Events (CDE) held at Piedmont Technical College in Greenwood on Saturday, March 30, 2013. STHS FFA Agronomy Team. (L-R): Trent Miller, Ryan Thurmond, Ben Rohr, Scott Sherman, and Zack MacDougal (SC FFA Association). 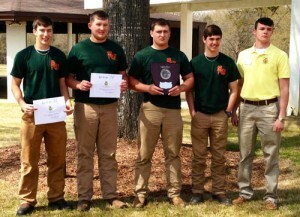 The Thurmond FFA Agronomy Team was named the State Runner-Up in the South Carolina FFA State Agronomy Finals. Team members Ryan Thurmond, Third High Individual Scorer in the state event; Trent Miller, Ben Rohr, and Scott Sherman successfully competed against teams from high schools throughout the state. The team was coached by Jeremy Brooks and Darla Steele, Agricultural Education Teachers and FFA Advisors at Strom Thurmond Career Center. The agronomy contest consisted of a written test, agronomy calculations team event, live sample plant identification, plant disease and disorders identification, insect identification, and equipment identification. The South Carolina State Agronomy Career Development Event was planned and coordinated by the Agriculture Department at Piedmont Technical College. STHS FFA Tool Identification Team. 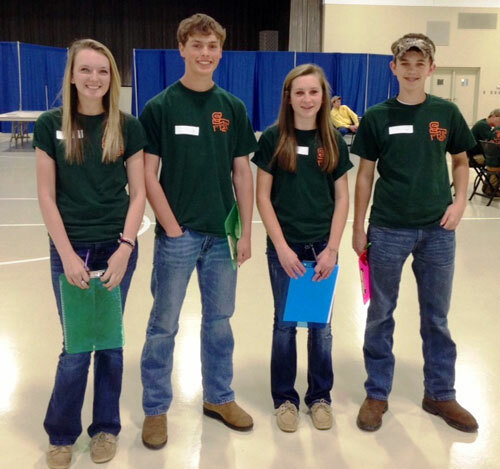 (L-R): Mallory Fulmer, Henry Cartrett, Alana Thurmond, and Austin Hall. The Thurmond FFA Tool Identification Team also competed Saturday and was named the fourth place team in the South Carolina State Tool Identification Competition. Team members Alana Thurmond, Mallory Fulmer, Henry Cartrett and Austin Hall competed against twelve other high schools from across South Carolina. The team was coached by Jeremy Brooks and Darla Steele, Agricultural Education Teachers and FFA Advisors at Strom Thurmond Career Center. The tool identification contest consisted of a written test on proper tool usage as well as a part on tool identification. The South Carolina State Tool Identification Career Development Event was also planned and coordinated by the Agriculture Department at Piedmont Technical College. For more information regarding the agriculture program at the Strom Thurmond Career Center, contact Darla Steele or Jeremy Brooks at the career center, (803) 275-1767 or visit the agriculture program website at www.stromthurmondffa.com.